An innocent man with coveted property is targeted, tricked, and murdered by a notorious husband and wife team. The wicked husband, a political leader, repents of this egregious act and is spared from certain punishment by death. His power-hungry wife relishes in her evil accomplishment but ultimately faces the consequences of her actions. Sounds like contemporary political intrigue or the plot line for a new movie or television series. It’s actually a captivating Old Testament story that gives us insight into the wide range of human behavior and God’s response. In fact, there are numerous lessons we can extract from this one story alone. It’s the story of the infamous King Ahab, his wife Jezebel, and an unfortunate man named Naboth. The Motive and Crime. Ahab ruled over the Northern Kingdom of Israel in the latter 9th century BC. 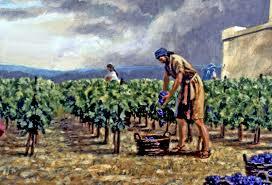 Naboth had a vineyard near King Ahab’s palace in the countryside outside his capital city of Samaria (1 Kings 21:2). Ahab wanted this vineyard so he could convert it into a vegetable garden. He offered to pay Naboth outright for it or exchange it for an upgraded plot of land. Naboth refused. He was actually following God’s Law handed down from Moses to the Hebrews that an Israelite’s family inheritance should not be sold (Leviticus 25:23, Numbers 36:7). King Ahab was not happy with this response and returned home “sullen and angry” that he could not have Naboth’s vineyard. He even refused to eat (1 Kings 21:4). When Ahab’s wife, Queen Jezebel, learned the full reason for her husband’s unhappiness, she chastised him for his passivity and assured him that she would “get the vineyard of Naboth” (1 Kings 21:7). She conjured a deceitful plan involving forged letters from the king and the hiring of “two scoundrels” to falsely accuse Naboth of cursing both God and the king (1 Kings 21:8-12). Based on these trumped up charges, Naboth was taken outside the city and stoned to death (1 Kings 21:13). When King Ahab heard that Naboth was dead, he went to the vineyard and now took possession of it (1 Kings 21:16). Judgment and Repentance. Because of the murder of Naboth, God condemned both Jezebel and Ahab. The word of the Lord came to Elijah the prophet in a terse message which he delivered to King Ahab: “Have you not murdered a man and seized his property?…In the place where dogs licked up Naboth’s blood, dogs will lick up your own blood… I (God) will bring evil upon your household…and dogs shall devour Jezebel by the walls of this city (1 Kings 21:17-24). After hearing God’s terrible pronouncement of judgment, Ahab repented before God for his actions toward Naboth (1 Kings 21:27). Because of Ahab’s humble response, God chose not to bring the promised disaster on Ahab during his lifetime but instead during “his son’s days” (1 Kings 21:29). Here are 7 object lessons that can be derived from this tragic story sown of idle greed, power, and evil. God is not rushed. – God is very comfortable with letting things play out over a very long period of time. Justice was ultimately served many years after the death of Naboth. God is not mocked. – What God says is Truth and is to be obeyed. His Law and precepts are specific and purposeful. Ahab disregarded Naboth’s Godly obedience. Good people suffer and even die. – Despite our obedience, as humans we all die – even, unfortunately like Naboth, due to the evil intentions of others. In God’s omnipotence and omniscience, He doesn’t necessarily save us all from early death. This says something about the comparative value of eternity. Evil people seem to get away with it. – Whether it’s lying, cheating, stealing, hurting, or even killing, it seems that sometimes the bad guys get a way with it. It’s not for us to judge how God will deal with wrongdoings. We can trust however that God sees all wrongdoings. God deals with evil and disobedience. – While often not in our timing or manner or to our liking, all evil and disobedience is ultimately dealt with by God. There’s no getting around it. He has the final say. God is forgiving. – Even evil King Ahab was given mercy by God. Yes, his next generation paid the price for his deeds (see #5), but Ahab was able to reap the benefit of his repentance to God in his own lifetime. God always speaks Truth. – Whenever God promises something directly in the Scriptures through one of His human prophets, you can always count on it coming to fruition. He is, after all, God. Do you know these lessons?